The real estate sector in our country is passing through troubled times, beleaguered by a slump in the sales and, consequently, the slowing down of the construction activities. The currency recall move by the government is also being predicted as a precursor to stagnant growth in this very crucial sector that is the second largest employer after agriculture and is the very pulse of allied industries ranging from steel to bamboo. This disturbing development does not augur well for the economic activities in associated industries like cement, steel, home furnishings, interior décor, etc. The slowing down had, however, been neither sudden nor unexpected. There had already been a major concern for quite some time, even without taking currency recall move into notice, about the stability of the sector. Real estate in India is overpriced, and its market rigged. That there is a huge pile up of unsold properties despite there being millions of people in the country without a house of their own is quite ironical and reflects a depressing scenario. As high rentals have been out of the reach for the middle-class households and heavy investments in the real estate not commensurate with returns, the bubble had to burst, resulting in an inevitable slowdown in further growth. Besides, delays in the securing of necessary governmental approvals for construction projects and high interests on bank loans adversely affected the sector. Some relief can be expected after bank assets will see a phenomenal increase in assets, backed by deposits of older bank notes, resulting into credit growth and interest rate cuts. In any case, notwithstanding the reasons for the slowing down, there could be no two opinions about the need to resuscitate the flailing industry as it is a crucial contributor to the financial growth and economic development of the country. Hence, it is imperative that the afflicted segment is put back on the rails with corrective steps and suitable measures. Also, let not give opposition parties an additional theme to target the BJP-led government on currency recall move in a case where due to further slowing of this sector, the already ailing workforce may face negative job creation. What Ails the Realty Sector? The principal reason for the sluggishness in the real estate sector is the dynamics of the industry not being in sync with the constraints and limitations of the consumers whose numbers are ironically on the rise. The awareness of the middle class in general and the salaried class in particular, of the need for ownership of apartments, has been growing. Home ownership ranks quite high among the priorities of the city dwellers. The government, on its part, is committed to make affordable housing for all a possible and viable reality. Its ‘Housing for All by 2022’ mission is meant to enable the rehabilitation of slum-dwellers and the promotion of affordable housing for the urban poor. The target is to provide nearly 20 million houses over seven years. The program aims to make urban slums a thing of the past by replacing them with eco-friendly dwelling units. The mission’s outreach would additionally complement Prime Minister Narendra Modi’s Swachh Bharat Abhiyan. The Union Government has announced that an average Central Government grant of Rs 1,00,000 would be available for the construction of a house under the slum rehabilitation program. The State governments could, however, exercise flexibility and spend the grant for any slum rehabilitation project by using land as a resource for providing houses to slum-dwellers. The Central government has also stated that the task at hand is to build an estimated two crore houses. However, the exact number would depend on a demand assessment to be carried out by all the states or cities by integrating Jan Dhan Yojana account numbers, Aadhaar numbers, or any such identification of intended beneficiaries. The government’s ambitious program has come as a shot in the arm for the construction industry. The Central government’s mission of ‘Housing for All’ is in response to the huge demand for houses in the country. The government would, in furtherance of this program, do well to take crucial steps to make the entire process of its implementation swift and fruitful. For this purpose, the interests of all the stakeholders like the developers, banks, and the buyers need to be factored in. The problem areas in the ambitious housing program have to be identified and resolved. For instance, the huge time lapse between the announcement of a housing project and the completion of that project has to be significantly reduced. Governmental approvals for the acquisition and development of land, construction plans and necessary clearances have to be speeded up. To this end, multiplicity and overlapping of authorities should be done away with and approvals accorded in a time bound manner. For this purpose, necessary cooperation between different agencies and authorities should be ensured using a swift coordination process. As bank loans are secured by the developer for the implementation of the projects, add-on payments flowing from infructuous expenditures on account of inordinate delays should be ruled out. Timely deliverance of governmental approvals would enable the developer to complete the project as per the original timeline and payment schedule and avoid frustrating and time-consuming litigations. Single-window clearances for projects, digitization of records and grading of developers are measures that would help create a systemic change in the prevailing bureaucratic culture of corruption and confusion in the sector. There has already been a growth in bank credit to the developers as well as in home loans to buyers of residential units, which signals a healthy credit situation. Furthermore, the Reserve Bank of India has chopped 175 bps from its key repo rate since the start of 2015. There is a need to further revise home loan interest rates, premiums and taxes applicable to residential properties to make them more appealing. This step, coupled with a spurt in the country’s Gross Domestic Product (GDP) and employment scenario, would contribute to the revival of the construction activity. A crash in property prices resulting from a lack of demand and overall stagnation over a prolonged period is likely to result in the prices and incomes of buyers becoming better aligned. As of now, property prices are not sustainable, and real estate is not a worthwhile sector for investment. Revealing that there used to be a trend of buying second homes a few years ago, Manavjeet Singh, CEO & Founder of Rubique said slow growth and the high-interest rate had ended this trend as the returns are not good enough. Furthermore, lately real estate as an investment option has been put on the back burner because of the poor returns, he added. The currency recall move strikes the right chord here. With an increase in the assets of banks over liability, interests on term deposits is anticipated to reduce, which in turn will pave way for home loans at more attractive rates. Even in a scenario where we consider prices at same levels, property will become a preferred investment option for buyers as they will now not seek paltry interest on deposits offered by banks. Rather, investing in property will enable buyers own an asset, besides earning better returns by renting the property and availing tax benefits on interest and principal repayment of home loans. While promptly according clearances for construction projects, the responsibility of the Central and State governments to factor in the mandatory infrastructure requirements and safety norms cannot be overemphasized. Recent floods in Chennai and Bengaluru and the havoc that ensued resulting in tremendous human tragedy and hardships for the inhabitants of these cities have borne evidence to the callous disregard for the basic requirements of logistics, safety standards and, above all, the utter failure of the disaster management system, if any. It was a shocking revelation to know that residential properties had come up on marshlands and lake beds in total disregard of the norms of city development plans. The state governments must ensure that such lapses and breaches do not recur in the future and the lacunae are rectified. The laws and bylaws of urban development must be scrupulously followed while processing plans of construction projects for clearances. 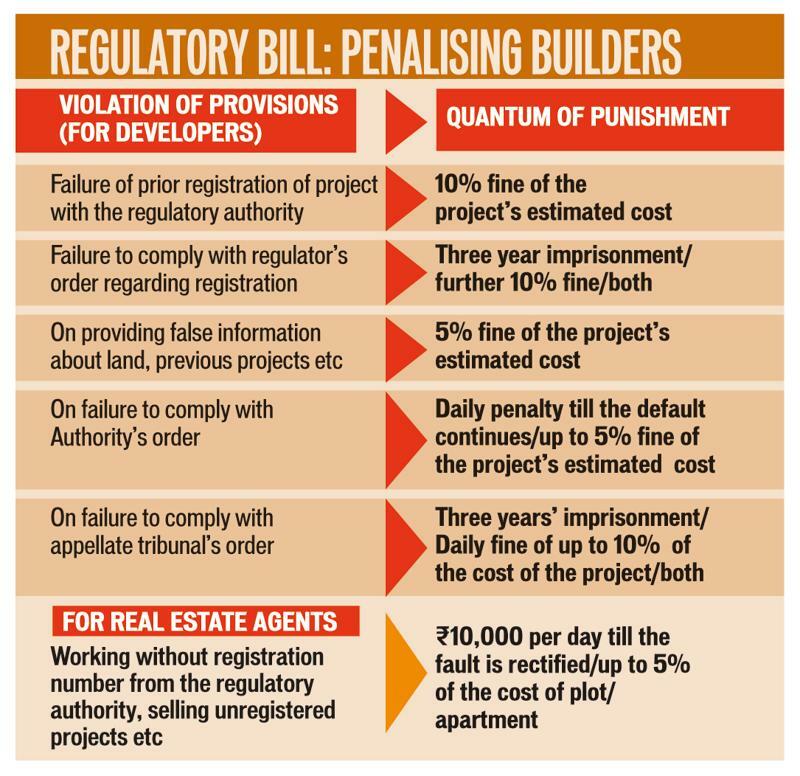 Incentives for officials deployed at places where construction conforms to the laid down norms and disincentives for ones under whose control builders mock regulations will ensure proper supervision and better law enforcement. Roads, bridges, flyovers, hospitals, parks, schools, network of public transport, fire safety measures, car parks, garbage disposal and other basic facilities and amenities should be mandatory norms for every residential area. It should be equally binding on the developers and the government to ensure the existence and availability of these facilities and amenities, without any kind of compromise. Thanks to the slowdown in the sales of residential properties, there was an accumulated stock of 6,90,000 unsold residential units across the country at the end of 2015, according to one estimate. The developers would be keen on liquidating the pile up before announcing new launches though the consumer confidence is quite high. This is all the more so in view of the fact that construction costs and statutory dues have gone up. In such a scenario, prospects of new launches do not appear to be much too bright. All the same, the developers may take heart from the fact that with only less than 40% of the Indian population currently living in cities, more migration from the rural to urban areas is likely in the future. Such a trend, coupled with a steady 7% to 8% annual growth in the Gross Domestic Product (GDP) makes the picture in the real estate sector rosy – as rosy as it can get under the prevailing conditions. Not to mention the long-term impact of currency recall that shall boost buyers’ confidence as well as capacity to purchase with loans that are lighter on pockets. In the meanwhile, the government has come up with the Real Estate Regulatory Act (RERA), duly passed by both the Houses of Parliament. The bill focuses both on residential and commercial real estate. It aims at streamlining the process of developing and buying a house while keeping in mind the interests of both the buyer and the seller. It calls for the establishment of a Real Estate Regulatory Authority in every State or Union Territory to regulate real estate transactions. It also tries to make the sector more conducive to investments, something that is currently lacking in the sector. The implementation of the bill will likely raise the trust of investors in the market, encouraging them to invest more. The builders are mandated to put 70% of all funds in an escrow account. Another salient feature of the bill is to bring in the foreign direct investment (FDA) into the market, which could go a long way in curbing the circulation of black money. Most importantly, for the buyers the bill lays down a series of strict guidelines, making it incumbent upon the developers to deliver on time. The bill constitutes yet another important measure by the government to put the real estate sector on the right track. However, rating agency ICRA says though RERA will benefit the buyers and investors because it has provisions to ensure timely and orderly delivery of projects, some of the problems faced by the developers continue to remain unaddressed in the Act. As such, the Union and State governments should look into and address the pending issues such as the multiplicity of approvals required and lack of adequate funding avenues. In the post-currency recall scenario, with improved asset-liability conditions of banks, instructions must flow to the heads of state-run and private banks to amplify lending to real estate developers and allied industries so that lack of capital doesn’t become an originator of delayed deliveries and cost overruns. This, in turn, will enable the developers to expedite the project execution process. More and more states must be brought into the ambit of amending their respective land acquisition laws by diluting some strict provisions and borrowing business-friendly covenants (relaxation of social impact assessment and land leasing) from model land acquisition bill promulgated by the centre, however dropped due to fierce disapproval by opposition political parties. Lately, states like Gujarat and Uttar Pradesh have amended their acts in accordance. The government must ensure the passage of a single window clearance system so as to allow the sector to work in a more systematic and organized manner. This requirement assumes urgency especially in view of the court strictures against delays by some real estate developers. Digitization of records and grading of developers would further enhance transparency and accountability. The sector needs recognition for being the biggest segment of contribution to the nation’s GDP and accorded the industry status. This would systematize and regulate the activities of over 30 industries, which come under the umbrella of the real estate sector. Although the government has given green signal to RERA, the effect of the functioning of the Act on the ground is yet to be felt by the stakeholders. Implementation of the Act needs to be speeded up so as to eliminate the apprehensions of the developers. Development of the basic infrastructure for amenities and facilities required in the residential areas to make the quality of living better in keeping with the standards of an advanced nation, which India is hoping to be in a few years’ time, should be jointly ensured by the developer and the government. This would make the properties really worth the price in the eyes of the buyer who finances the purchase with his lifetime savings and home loans. Entering into agreements with countries that have established themselves as pioneers in urban designing and development and roping in their expertise is an answer. Millions of Indians in the urban areas without a house of their own find the acquisition of a house a scary prospect as the process involves repayment of home loans by EMIs at elevated interest rates. Neatly dovetailing into this sad scenario is the fact that a city dweller ends up paying about 30-35% of his salary as house rent month after month, year after year, with his dream of owning a house receding into the distant horizon. Further reductions by RBI in the interest rates on home loans would serve as a soothing balm for the frayed nerves of the hapless buyer, which in turn would also benefit the developer. Now that the RBI has a new monetary policy committee with say of government in decision over interest rates, this is a time to ease some pressure over home buyers burdened under high EMIs. The action points encapsulated above for the government’s consideration are the primary ones urgently needed to haul the real estate sector from the mire of sluggishness it is currently steeped in. More ingenuity and out-of-the-box thinking would be called for as the dismal situation afflicting the sector becomes clearer and the overall economy of the country gets better. In the present drive against black money where high denomination notes have been recalled, government’s coffers would see a bonanza coming from tax on deposits that are superfluous and do not match with returns filed; not to forget the increased dividend from RBI to the government with its liability extinguished to some extent due to non-deposit of notes by black money hoarders. It is the apt time to invest in urban infrastructure development programs Smart City Mission, Swachh Bharat and Housing for All, which will drive the cycle of growth for the real estate sector. Real estate is the sphere of rich and middle class. Not all Indians dream of owing a house, but they need to fight poverty and unemployment. Government should first work on essentials. After 2004, the real estate sector of India saw an unprecedented boom due to high urbanisation and spending capacity. Present time in not favourable unless there is growth in job sector and manufacturing activity. The recent Act has made it even more difficult for developers. They are now left with no other option than to quit this market. Cash component in entire black money was not more than 10 percent, remaining is in real estate and benami properties. Government should come up with a step to curb this. Many builders have their bank loans in default since their returns are not matching projected outcomes. This is why even bank NPAs are on a rise. If the countrys economy is lifted after demonetisation then only property market will shine. Not to forget that present state is very unpromising. Housing for All is the project of central government where state governments have a role to play. Only if land is available and people are educated about this, we can expect that all Indians will have house by 2022. What is the use of so many high storey buildings when drains are choked and street lights are not fucntioning. Urbanisation in India is still not matching global standards. Middle class and lower middle class population are going through a great crunch in savings and surplus. Employment in these days are mobile in many cities. Option for settlement in a particular area is remote. It May be necessary to think to construct more rentable apartment/houses with options to buying in future. We may try this strategy. 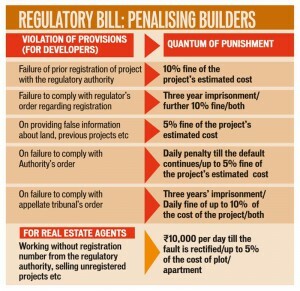 Builders make fun of regulations by bribing officials and constructing not as per agreeement. Unless the buyer is confident of what he purchases, this market will remain stagnant. Basic infrastructure is the need of every society. Roads, public transport, proper sewage lines and round the clock electricity are duties of state.